The sixth-seed Panthers found themselves back in the championship game Saturday after falling short to Garden Plain last year. Royal Valley and Cheney battled back and forth in the first quarter with sophomore Mahpiya Irving opening the game with a three-pointer. Cheney’s Lexi Cline put the Cardinals on the board with two points, followed by two from RV senior Mary Broxterman. Kylee Scheer, daughter of Cardinal coach Rod Scheer, tied the game at 5-5 with a three-pointer. Earlier in the tournament, Scheer scored a record-setting 38 points against Columbus. Broxterman added seven more points and Cheney’s Layne Needham made a shot to end the quarter 12-7 in the Panther’s favor. Needham scored in the paint for the Cardinals at the start of the second quarter, and senior Menon Irving hit a three-pointer, her ninth of the season. The Cardinals then went on a 14-0 scoring run to take the lead, 23-15. A free throw and a field goal by Broxterman and an inside shot by sophomore Wakiyan Irving slowed the Cardinals. The Cardinals made one free throw to end the half, 24-19. In the first half, the Panthers had 16 rebounds, 6 turnovers and shot 7-28 field goals and 2-13 three-pointers. The Cardinals had 20 rebounds, 9 turnovers and shot 10-24 field goals and made 3-8 threes. Cheney’s players took advantage of several second chance shots and scored 15 points in the third quarter. At one point, the Cardinals led by 12 points, 31-19. The Panthers battled to keep up with 6 inside points from Broxterman, a three-pointer by Senior Kiikto Thomas, an inside shot by Ma. Irving and a free throw by Wa. Irving. At the end of the third quarter, Cheney remained on top, 39-32. A free throw by Cheney’s Scheer and two by RV’s Thomas started the final quarter. Wa. Irving hit an inside shot to close the gap, 40-36. The Lady Cardinals then added three more points. Wa. Irving made a three-pointer, and a field goal and a free throw by Broxterman made it 43-42 in Cheney’s favor with three minutes left to play. After another free throw by Cheney, Broxterman tied the game, 44-44. Scheer added two more free throws to take the lead, but Wa. Irving made a shot to tie the game at the end of regulation, 46-46. In overtime, Scheer made two free throws followed by Broxterman who converted a three-point play to give RV the lead, 49-48. Scheer responded with a basket and then senior Emily Albright made her first shot of the game to keep RV up, 51-50. With 27 seconds left in the game, Ma. Irving hit the winning shot – a three-pointer – to give the Panthers the championship. The Panthers made 19-50 field goals for 38 percent and 5-21 three-pointers for 23.8 percent. The team had 11 steals, three blocks (all from Thomas), 12 assists and 15 turnovers. The Cardinals shot 18-44 field goals for 40.9 percent and 5-14 three-pointers for 35.7 percent. The team also had 8 steals, one block, 11 assists and 19 turnovers. RV shot 12-15 free throws (80 percent) and Cheney was 11-17 (64.7 percent). Broxterman had 25 points, including 7-8 free throws, and 14 rebounds. Ma. Irving chipped in 12 points, including three three-pointers, and three steals. Cheney was led by Scheer, who had 15 points, and Needham, who had 14 points. The Lady Cardinals ended their season 23-3. This was the program’s ninth appearance at the state tournament semifinals. They lost in the championship game in 2017 to Hugoton. RV: Albright 1 0-0 2, Ma. Irving 1 (3) 1-1 12, Wa. Irving 3 1-2 7, Thomas 0 (1) 3-4 6, Broxterman 9 7-8 25. Totals 14 (5) 12-15 55. Cheney: Scheer 2 (2) 5-6 15, Cline 2 0-1 4, O’Shea 1 (2) 2-2 10, Needham 6 2-4 14, Albers 1 (1) 2-4 7, Pipkin 1 0-0 2. Totals 13 (5) 11-17 52. The Lady Panthers’ defense dominated the first half of the team’s semifinal game against Norton (no. 2 seed) on Friday leading to a 24-6 halftime score. The Lady Bluejays rallied in the second half, but the Panthers were able to hold on, 53-44, and secure a back-to-back trip to the finals. RV began the game with a 7-0 run with a three-pointer by Ma. Irving and two points each from Broxterman and Wa. Irving. Norton committed four turnovers early before Taryn Kuhn scored the Bluejays’ only two points of the quarter. The Panthers finished the quarter 11-2 with another shot by Broxterman and two free throws by Albright. Thomas opened the second quarter with a three-pointer, and Norton’s Hadley Hauser answered with two points. Broxterman scored the next five points, two field goals and a free throw, and a layup by Tessa Hauser made it a 19-6 game. Broxterman scored two more on a fast break and drew the foul, turning it into a three-point play. Two free throws by Thomas ended the quarter, 24-6. At the half, RV had 17 rebounds and committed 9 turnovers. The Panthers made 8-17 field goals, 2-7 three-pointers and 6-7 free throws. The Bluejays had 10 rebounds and 8 turnovers. They made 3-12 field goals and 0-8 three-point attempts. Scoring opened up for the Bluejays in the third quarter, but the Panthers had an answer for each Bluejay bucket. Broxterman had nine points in the third quarter, while teammates Wa. Irving had six points and Thomas added another three-pointer. Norton had 16 points, including five from H. Hauser. The Lady Bluejays went on an 8-0 scoring run to start the fourth quarter to make it 42-30. Two free throws by Broxterman broke up the run and then Norton’s Kuhn answered with two points. Wa. Irving and Me. Irving each made one free throw, and Broxterman then added a layup to make the score 48-32. Another 8-0 scoring run by Norton kept the Panthers on their toes before Ma. Irving had a big three to break it up. Broxterman and H. Hauser both had two points to bring the Bluejays within 10, 52-42, with 46 seconds left in the game. Three final free throws, one by Thomas and two by Kuhn, ended the game. The Lady Panthers made 17 of 34 field goal attempts in the game for 50 percent and 4 of 13 three pointers for 31 percent. They were 15-24, 63 percent, at the free throw line. The Lady Panthers had 31 total rebounds (8 offensive and 23 defensive) and 17 fouls. The team also had four steals, 10 assists, four blocks (three by Thomas) and 17 turnovers. Norton had 25 rebounds (13 offensive and 12 defensive). The Lady Bluejays had 20 fouls, 9 assists, 10 turnovers and 4 blocks. Broxterman led the team and all scorers with 26 points. She also had 9 rebounds. Thomas had 9 points, 9 rebounds and 5 assists. Wa. Irving also had 9 points. Kuhn led Norton with 16 points and 3 rebounds. H. Hauser added 12 points, 5 rebounds and 2 blocks. 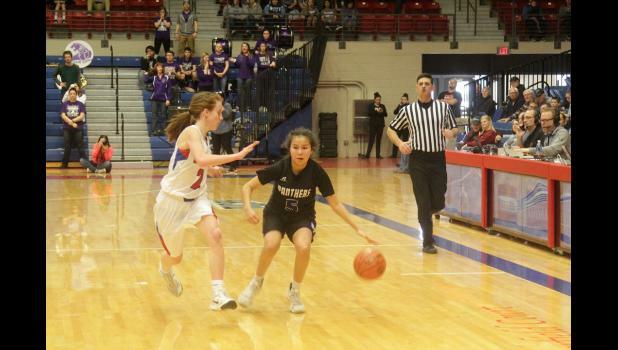 This was Norton’s seventh semifinal appearance at the girls state basketball tournament. The Bluejays ended their season 23-3. RV: Albright 0 2-2 2, Ma. Irving 0 (2) 0-0 6, Wa. Irving 4 1-3 9, Thomas 0 (2) 3-6 9, Broxterman 9 8-11 26, Me. Irving 0 1-2 1. Totals 13 (4) 15-24 53. Norton: T. Hauser 3 0-3 6, Kuhn 5 6-6 16, Hartwell 1 0-2 2, H. Hauser 5 2-3 12, Engelbert 2 0-0 4, Bailey 1 2-2 4. Totals 17 10-16 44. If the Panthers were nervous about returning to the state tournament last Wednesday afternoon, they didn’t show it as they coolly defeated the Eureka Tornadoes (no. 3 seed), 56-36, in the opening round. The Panthers opened the game with two jumpers from Broxterman. Eureka’s Brooklyn Ptacek put the Tornadoes on the board with an inside shot. With two free throws by Ma. Irving and a layup by Broxterman, the Panthers edged Eureka 8-2. Chazni Barker added two points for the Tornadoes, but Broxterman added three more points at the free throw line to keep RV ahead. With an inside shot by Madelyn Koop and a three-pointer by Booklyn Hilton, Eureka closed the gap to 11-9, but a three-pointer by Ma. Irving would close out the quarter in the Panther’s favor, 14-9. After a quick bucket by Ptacek to start the second quarter, Wa. Irving hit a three-pointer for the Panthers. Barker answered with her own three to bring the score to 17-14. Another banked shot by Broxterman and a trey by Wa. Irving helped build the Panther’s confidence. After a made free throw by Koop, Albright started to catch fire and scored a three-pointer – her fourth of the season – near the two-minute mark. Koop added one more inside shot before Albright ended the quarter with another three-pointer and a field goal to give RV a comfortable 31-17 lead at the half. In the first half, the Panthers had three turnovers and 16 rebounds, and the Tornadoes committed eight turnovers and had 14 rebounds. The Panthers stormed out of the locker-room and went on a 14-0 run, including eight points from Broxterman and two each from Albright, Wa. Irving and Thomas. Koop took charge for the Tornadoes and went on a 6-0 scoring run. Teammate Ptacek added one more bucket before Ma. Irving hit a three for the Panthers. Two points by Eureka’s Barker and two by Broxterman brought the score to 49-27 at the end of the quarter. The Panthers slowed and had trouble with turnovers in the fourth quarter, allowing the Tornadoes to score four points before Broxterman added another from the inside. Eureka scored the next five points – a free throw and two field goals – before the Panthers ended the game with a three-pointer from Ma. Irving and two more points from Broxterman. The Lady Panthers made 22 of 49 field goal attempts in the game for 44.9 percent and 7 of 17 three-pointers for 41.2 percent. The Tornadoes, who ended their season 20-4, made 16 of 45 field goals for 35.6 percent and 2 of 8 three-pointers for 25 percent. Both teams had 28 total rebounds and the same rebounding stats (10 offensive and 18 defensive). The Panthers also had 9 fouls, 18 assists, two blocks (both by Thomas) and 15 turnovers compared to the Tornadoes who had 11 fouls, 8 assists and 21 turnovers. Broxterman lead the team with 25 points, eight rebounds and three steals. The Tornadoes’ coach, Shelly Hoyt, is one of the winningest coaches in girls basketball history. Hoyt coached Hoxie, a Class 1A school, to a state record 107 straight wins and four straight state titles in 2012, 2013, 2014 and 2015. This was Hoyt’s second season with Eureka. RV: Albright 2 (2) 0-2 10, Ma. Irving 0 (3) 2-2 11, Wa. Irving 1 (2) 0-0 8, Thomas 1 0-0 2, Broxterman 11 3-4 25. Totals 15 (7) 5-8 56. Eureka: Escareno 2 0-0 4, Barker 3 (1) 1-2 10, Hilton 1 (1) 0-0 5, Koop 5 1-2 11, Ptacek 3 0-0 6. Totals 14 (2) 2-4 36. Broxterman had 76 points during the entire tournament and averaged 10 rebounds per game. This is Royal Valley’s first state basketball championship as a district. The district’s only other state championship team was the Panther cross country team in 1974. Porter’s assistant coaches this season were David Boucher and Marizona Chapman.